Overview: Twelve essays written between 1928 and 1945 that demonstrate key points in the development of Eisenstein’s film theory and in particular his analysis of the sound-film medium. Edited, translated, and with an Introduction by Jay Leyda; Index; photographs and diagrams. Overview: (Music On Filments). In 1984, four comedians Christopher Guest, Michael McKean, Rob Reiner, and Harry Shearer unleashed This Is Spinal Tap , the world’s first "mock-rockumentary" and a joke that has lasted into the 21st century and inspired a generation of imitations. Now, award-winning film journalist John Kenneth Muir ( An Askew View: The Films of Kevin Smith ) escorts the reader through a quarter-century of heavy metal laughs, offering a detailed history of the film’s genesis and an up-close look at the reasons why this beloved rock-and-roll movie comedy has endured for so long, and even met acceptance in the rock-and-roll culture it lampoons. Features interview material with the cinematographer, editor, and some supporting cast members of This Is Spinal Tap as well as "King of Nostalgia" Joe Franklin. Overview: Making a compelling argument for the continuing relevance of Brechtian film theory and cinema, this book offers new research and analysis of Brecht the film and media theorist, placing his scattered writings on the subject within the lively film theory debates that took place in Europe between the 1920s-1960s. Furthermore, Angelos Koutsourakis identifies key points of convergence between Brecht’s ‘unfinished project’ and contemporary film and media theory. With case studies of films ranging from Robert Roberto Rossellini’s Paisà to Bernardo Bertolucci’s 1900 and Joshua Oppenheimer’s The Act of Killing amongst others, this study challenges many existing preconceptions about Brecht’s theoretical position and invites readers to discover new ways of apprehending and making use of Brecht in film studies. Overview: With its increasing presence in a continuously evolving media environment, the essay film as a visual form raises new questions about the construction of the subject, its relationship to the world, and the aesthetic possibilities of cinema. In this volume, authors specializing in various national cinemas (Cuban, French, German, Israeli, Italian, Lebanese, Polish, Russian, American) and critical approaches (historical, aesthetic, postcolonial, feminist, philosophical) explore the essay film and its consequences for the theory of cinema while building on and challenging existing theories. Taking as a guiding principle the essay form’s dialogic, fluid nature, the volume examines the potential of the essayistic to question, investigate, and reflect on all forms of cinema fiction film, popular cinema, and documentary, video installation, and digital essay. Overview: Combining transnationalism and exoticism, transorientalism is the new orientalism of the age of globalization. Withits roots in earlier times, it is a term that emphasizes alteration, mutation, and exchange between cultures. While the familiar orientalisms persist, transorientalism is a term that covers notions like the adoption of a hat from a different country for Turkish nationalist dress, the fact that an Italian could be one of the most influential directors in recent Chinese cinema, that Muslim women artists explore Islamic womanhood in non-Islamic countries, that artists can embrace both indigenous and non-indigenous identity at the same time. This is more than nostalgia or bland nationalism. It is a reflection of the effect that communication and representation in recent decades have brought to the way in which national identity is crafted and constructed-yet this does not make it any less authentic. The diversity of race and culture, the manner in which they are expressed and transacted, are most evident in art, fashion, and film. Overview: Film magazine for all of you all information about film, movies with German language. Overview: When the movie business adopted some of the ways of other big industries in 1920s America, women-who had been essential to the industry’s early development-were systematically squeezed out of key behind-the-camera roles. Yet, as female producers and directors virtually disappeared for decades, a number of female film editors remained and rose to the top of their profession, sometimes wielding great power and influence. Their example inspired a later generation of women to enter the profession at mid-century, several of whom were critical to revolutionizing filmmaking in the 1960s and 1970s with contributions to such classics as Bonnie and Clyde, Jaws and Raging Bull. Focusing on nine of these women and presenting shorter glimpses of nine others, this book tells their captivating personal stories and examines their professional achievements. Overview: When viewers think of film noir, they often picture actors like Humphrey Bogart playing characters like Sam Spade in The Maltese Falcon, the film based on the book by Dashiell Hammett. Yet film noir is a genre much richer. The authors first examine the debate surrounding the parameters of the genre and the many different ways it is defined. They discuss the Noir City, its setting and backdrop, and also the cultural (WWII) and institutional (the House UnAmerican Activities Committee, and the Production Code Administration) influences on the subgenres. An analysis of the low budget and series film noirs provides information on those cult classics. With over 200 entries on films, directors, and actors , the Encyclopedia of Film Noir is the most complete resource for film fans, students, and scholars. Each issue offers in-depth features on the biggest movies – both mainstream and arthouse. You’ll find the latest movie news, reviews of all the new releases, star interviews, on-set reports and an extensive home entertainment guide that rates all the new releases in DVD, Blu-ray, videogames, books and soundtracks. 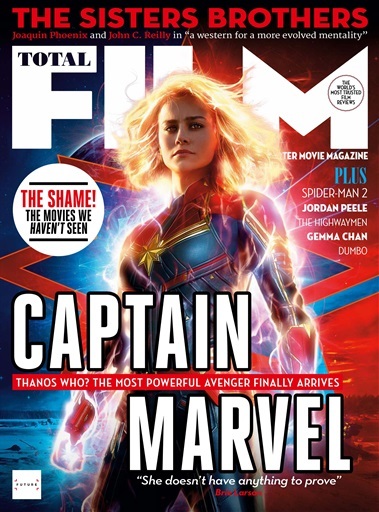 If you love movies, then Total Film is your unmissable monthly companion.